Our beautiful, children friendly, Somerset West BnB is only 25 min from the Airport (Collection and Car Hire available), Easy to Find and just 4 min from N2. NB! We are new to VBRO and have Super host status on Airbnb. you can Google: yellow wood cottage somerset west airbnb for our awesome reviews from guests. 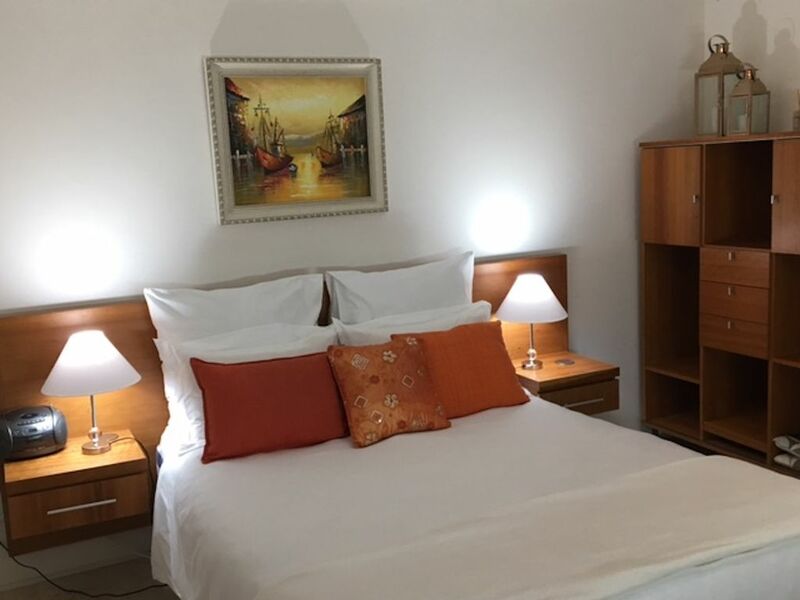 It has a clean classic look with travertine tiles in the bedroom and bathroom and a Hastens Bed for the best sleep ever after long days of fun, you can plan amazing trips across the Cape. Breakfast Priced Separately. Yellow Wood Cottage BnB has the second oldest Yellow Wood Tree in Somerset West. Located on a 2500 square meter plot up a panhandle makes our BnB a very peaceful and sheltered Home away from Home. Our luxurious en-suite room has separate entrance are equipped a with flat screen TV with Netflix and Youtube or Apple TV (you need an account) - lets you remain self-contained for days (shopping can be provided as an additional service on request. Could be a bonus for honeymooners :-)). Experienced staff will make your stay a pleasure and our attention to detail will make your trip memorable. Once booked in, guests have keys to control their own access to and from the unit. Guests have access to the garden and pool with a fire pit for evenings of fun. One free parking bay available per room booked (when busy). Unfortunately the shared pool might not be available as the Western Cape has severe water restrictions currently and the pool may not be filled until they are lifted, also the garden might not be as green as the pics due to the water restrictions. We are a quick 180m (3min) walk from an Award Winning convenience store (Spar) that caters for international tastes/needs as well as a bottle store, hairdresser and a pharmacy. Baby items need to be requested in advance e.g. plug protectors, crib etc. Yellow Wood Cottage is situated in one of the sought after areas in Somerset West with many large parks/open spaces available within walking distance. 180m from a convenience store, bottle store, hairdresser and a pharmacy. Four minutes from Waterstone Shopping Mall. Eight minutes from Somerset West Shopping Mall. Fifteen minutes from the Beach Front. 2.4km from the N2 hi-way make the Cape easily accessible. Metered Taxis, Uber and a hire car are available on request. Having recently left the corporate world to relocate to Somerset West for our sick child, we are embarking on a new journey (establishing a new BnB) that allows us to interact with people on a different level. One that we expect will bring us more joy than before. We are positioned on a peaceful 2500m panhandle (surrounded by properties on all sides) with large old trees in a well-established garden (depending on the season, lack of water can impact the garden). We are perfectly positioned to provide easy access to wine farms, town, beach, Stellenbosch, international airport and even Cape Town should you need more active night life activities. As hosts, Tracey my wife and I are exceptionally detail focussed and will go out of our way to ensure that you have a great holiday. We believe that being successful in this business depends on the number of repeat business you get as well as gaining exposure via word of mouth from happy customers. Google: yellow wood cottage somerset west airbnb for more information. 6.1km away from the beach. Driving 5 minutes away from the beach will provide you with views of the ocean and surrounding mountains that are breath taking especially early in the morning or at sunset. This is a shared item. Laundry services are available as a service with a charge if required. Clean white 4 seater table as shown in the pictures is used for dining purposes. 42" LCD TV with Apple TV connected. You have access to Netflix (SA content) and Youtube or you can log in with your Apple ID and use the standard Apple TV features. The home is child-friendly including games, puzzles on request and a trampoline in the garden. There is a mix of road and MBT available for adults and children. Private and shared are available. Fins, goggles, snorkels and boogie boards are available. There is also a paddle ski available. A number of courses available within a 15km radius. The pool might not be available as we are experiencing a drought in the Western Cape.